Welcome to Steve Kaye Sport Fishing (formerly Streamside Adventures) it is my goal to give you the best guided fishing experience possible. 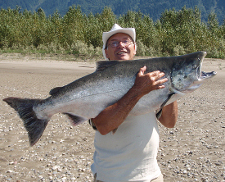 I have worked professionally in the sport fishing industry since 1994 and have guided hundreds of anglers on the Fraser River, Harrison River and the Chilliwack/Vedder River in the Fraser valley of British Columbia Canada. This is my profession and passion, not a part time hobby. When you step in my boat you will be fishing with a guide that is professional, experienced and believes in working hard every day to put fish in the boat and a guide that truly loves what he does for a living. Nothing is more rewarding to me than to see someone's angling dreams come true with that special catch of a lifetime. The Fraser River and Harrison Rivers are located just outside of Vancouver and have some of the best salmon fishing in the province. We are fortunate to have runs of all 5 species of pacific salmon including Chinook (kings) Coho (silvers) Sockeye (Reds) Pink (Humpies) and Chum available to our guided fishing clients. Guided salmon fishing charters are available from June until late November. Both spin fishing for salmon and fly-fishing for salmon is available to anglers depending on the time of year and the angler's personal preference. 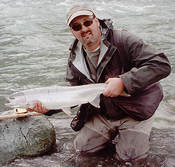 If the Fraser River were to have a signature fish than the White Sturgeon would be it! These prehistoric relics are simply incredible big game sport fish. Sturgeon are unbelievably strong hard fighting fish. I absolutely never get tired of seeing these fish getting airborne, you just have not been fishing until you see a sturgeon of 100,200,300lbs or more flying threw the air while attached to the end of your line. The feeling of watching helplessly as the line disappears off the reel while we have to leave the anchor and give chase before we get spooled is something that you will never forget. 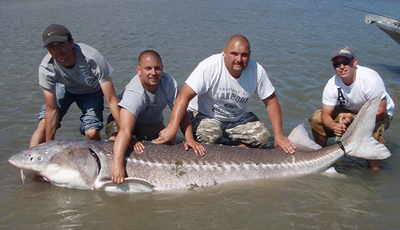 White sturgeon are not dossal bottom feeding slugs, they are true big game sport fish. A guided sturgeon fishing charter on the Fraser River is a great experience for any angler, but be careful these fish can be addicting! The Fraser Valley is also blessed with a solid winter steelhead fishery. These elusive fish are highly prized buy anglers looking for that special angling challenge. Guided steelhead fishing is a walk and wade fishery so be prepared to do some hiking! Our winter steelhead are between 7 and 15 lbs and are available from January through April. If you are looking a Salmon, Sturgeon or Steelhead fishing adventure in the Fraser Valley of British Columbia than give me a call. You have my personal guarantee that you will get a quality professional guided fishing experience.